Freshwater ecosystems are some of the most threatened environments on our planet. Globally, water quality has deteriorated rapidly since the 19th century, while water quantity is especially vulnerable in semi-arid regions. This has led to almost 80% of the world’s population being exposed to substantial water security threats. For over 20 years I have worked on assessing human and climatic impacts on some of the world’s most important freshwater ecosystems, including Lake Baikal and the Aral Sea in central Asia, and the Okavango Delta in southern Africa. Key to much of this work is the use biological organisms and stable isotopes to reconstruct past environments. I work in the Environmental Change Research Centre and the Palaeoclimate Research Group within the Department of Geography at UCL, one of the world’s leading universities. I teach at all levels of the curriculum, including undergraduates, MSc and PhD students. I have authored and co-authored over 100 peer-reviewed articles and have been PI on over 30 projects. 2017-2018: Late Pleistocene records of palaeoproductivity in southern Siberia: Funding body NERC. Reference: IP-1678-1116. The project is in collaboration with Professor Melanie Leng & Poppy Harding. 2016-2019: IGNEX: Interglacials and glacials - natural experiments in biodiversity dynamics. A new inter-disciplinary programme led by Prof John Birks at the Ecological and Environmental Change Research Group, Bergen University. 2016-2017: The effects of differential dissolution on the δ18O composition of diatom silica. Funded by NERC. Reference IP-1584-1115. The project is in collaboration with Professor Melanie Leng, Dr Andi Smith and Dr George Swann. 2012-2015: Silicon isotope records of recent environmental change and anthropogenic pollution from Lake Baikal, Siberia. Funding sourceNERC. Reference NE/J010227/1. Amount awarded £710,000. PI, Lead RO: George Swann; PIs: Matthew Horstwood. Adams, J.K., Peng, Y., Rose, N.L., Shchetnikov, A.A., Mackay, A.W. (in review) Diatom community responses to long-term multiple stressors at Lake Gusinoye, Siberia. Geo: Geography and Environment. Adams, J.K., Martins, C.C., Rose, N.L., Shchetnikov, A.A., Mackay, A.W. (preprint) Lake sediment records of persistent organic pollutants in southern Siberia mirror the changing fortunes of the Russian economy over the past 70 years. Dearing, J.A., Dyke, J.G., Haberl, H., Hossain, S.M., Langdon, P.G., Lenton, T.M., Raworth, K., Wang, R., Zhang, K., Brown, S., Carstensen, J., Cole, M.J., Cornell, S.E., Dawson, T.P., Doncaster, C.P., Eigenbrod, F., Flörke, M., Jeffers, E., Mackay, A.W., Nykvist, B., Poppy, G.M. (2014) Safe and just operating spaces for regional social-ecological systems. Global Environmental Change 28, 227-238. Mackay, A.W., Edlund, M.B. & Khursevich, G. (2010) Diatoms in Ancient Lakes. In: The Diatoms: applications in the environmental sciences.Eds: J.P. Smol & E. Stoermer. CUP, Cambridge. pp 209-228. Mackay, A.W. (2009) An introduction to Late Glacial - Holocene environments [Chapter 1]. In: “Holocene Extinctions” Ed. Samuel T. Turvey. OUP, Oxford. 1-15. Mills, K., Mackay, A.W., Bradley, R.S., Finney, B. (2009) Diatom and stable isotope records of late-Holocene lake ontogeny at Indrepollen, Lofoten, NW Norway: a response to glacio-isostacy and neoglacial cooling. The Holocene, 19, 261-271. Mackay, A.W., Mazebedi, R., Wolski, P., Davidson, T.A., Huntsman-Mapila, P. & Todd, M. (2008) Monitoring and simulating threats to aquatic biodiversity in the Okavango Delta: field and laboratory methods. Methods report to Darwin Initiative 162/14/029. ECRC Research Report 129, 35 pp. Mackay, A.W. & Oberhänsli, H. (2007) Editors. Special Issue: Reconstructing past environments from remnants of Human occupation and sedimentary archives in western Eurasia. Quaternary Research 67, pp. 313-410. Taylor, R.G., Rose, N.L., Mackay, A.W., Panizzo, V., Mileham, L., Ssemmanda, I., Tindimugaya, C., Nakileza, B., Muwanga, A. & Hau, J. 2007. Climate change and the aquatic ecosystems of the Rwenzori Mountains, Uganda. ECRC Research Report 113, 98 pp. Mackay, A.W. (2004) Palaeolimnological evidence for recent environmental change in tropical alpine Africa: assessing the palaeolimnological evidence from Lake Bujuku, Rwenzori Mountains National Park, Uganda. Small grant report to the QRA. Quaternary Newsletter, 104, 55-57. Mackay, A.W. (2004) Book review: The Climate in Historical Times (KIHZ). Eds: H. Fischer, T. Kumke, G. Lohmann, G. Flöser, H. Miller, H. von Storch, J.F.W. Negendank (Springer). EOS. 85(43) 26th October, 2004. Mackay, A.W. , Battarbee, R.W., Birks, H.J.B. & Oldfield, F. (Eds.) (2003) Global Change in the Holocene. Publisher: Arnold, London. Mackay, A.W. , Battarbee, R.W., Flower, R.J., Granin, N.G., Jewson, D.H., Ryves, D.B. & Sturm, M. (2003) Assessing the potential for developing internal diatom-based inference models in Lake Baikal. Limnology & Oceanography, 48, 1183-1192. Ryves, D.B., Jewson, D.H., Sturm, M., Battarbee, R.W. Flower, Mackay, A.W. & Granin, N.G. (2003) Quantitative and qualitative relationships between planktonic diatom communities and diatom assemblages in sedimenting material and surface sediments in Lake Baikal, Siberia. Limnology & Oceanography, 48, 1643-1661. Mackay, A.W. (2003) UK-BICER Final Report: 2000-2003. Report to The Royal Society summarising research achievements supported by the UK-BICER fund. 21 pages. Mackay, A.W. (2002) Lake Baikal. In: Encyclopedia of Global Environmental Change: Vol 3 Causes and consequences of global environmental change . Ed. : Ian Douglas. pp. 413-417. Chichester: John Wiley & Sons. Mackay, A.W. (2002) Book review Climates Past & Present, by M.B. Hart (ed). The Holocene, 12, 122-123. Mackay, A.W. (2001) UK-BICER Interim Report: 1998-2000. Report to The Royal Society updating research achievements supported by the UK-BICER fund. 11 pages. Bangs, M., Battarbee, R.W., Flower, R.J., Jewson, D., Lees, J.A., Sturm, M., Vologinova, E. & Mackay, A.W. (2000) Climate change in Lake Baikal: diatom evidence in an area of continuous sedimentation. International Journal of Earth Sciences, 89, 251-259. Mackay, A.W. , Battarbee, R.W., Flower, R.J., Jewson, D., Lees, J.A., Ryves, D.B. & Sturm, M. (2000) The deposition and accumulation of endemic planktonic diatoms in the sediments of Lake Baikal and an evaluation of their potential role in climate reconstruction during the Holocene. Terra Nostra, 9, 34-48. Royal Society SSSI Working Group Members (2000). The Future of Sites of Special Scientific Interest (SSSIs). Policy statement and report. Publisher: The Royal Society, London. 17 pp. Battarbee, R.W. & Mackay, A.W. (2000) Biogenic composition of recent sediments: diatoms. Abstract. Terra Nostra, 9, 223-225. Mackay, A.W. (2000) Book review: Principles of Paleoclimatology, by Thomas Cronin. The Holocene, 10, 537-538. Mackay, A.W., Long, X., Rose, N.L. & Battarbee, R.W. (1999) New approaches to characterizing urban air particles in central London. Journal of Environmental Science, 11(3), 367-372. Mackay, A.W. (1999) Pollution & Climate Change in Lake Baikal. Radio interview with Associated Press Television News. Mackay, A.W. (1999) Characterisation and temporal trends of primary particulate matter in the urban aerosol: functional relationships with traffic-related pollutants and meteorological variables. JEI Working Paper, 4, 95 pp. Mackay, A.W. , Battarbee, R.W., Flower, R.J., Jewson, D., Lees, J.A., Ryves, D.B. & Sturm, M. (1999) The deposition and accumulation of endemic planktonic diatoms in the sediments of Lake Baikal and an evaluation of their potential role in climate reconstruction during the Holocene. Final Report to NERC contract No. GR3/10529. ECRC Research Report, 59, 139 pp. Maslin, M.A. & Mackay, A.W. (1999) Muddying the Waters. The Guardian. 7-Jan-99, On-Line. Mackay, A.W. (1999) NERC-GEOPASS Final Project Review GR3/10529. ECRC Research Report, 54, 17 pp. Mackay, A.W. , Flower, R.J., Rose, N.L., Kuzmina, A.E., Granina, L.Z., Appleby, P.G., Boyle, J.F. & Battarbee, R.W. (1998) Recent trends in diatom succession in surface sediments from Lake Baikal and their relation to atmospheric pollution and to climate change. Philosophical Transactions of the Royal Society of London, Series B, 353, 1011-1055. Reviewed by Laurence, E. (1998) Diatoms pinpoint pollution in Lake Baikal. Nature Science Update , 6th August, 1998. Flower, R.J., Battarbee, R.W., Lees, J., Levina, O., Jewson, D.H., Mackay, A.W., Ryves, D.B., Sturm, M. & Vologina, E.G. (1998) Diatom deposition and sediment accumulation in Lake Baikal, Siberia: on-going inter-related NERC-GEOPASS studies. Freshwater Forum, 11, 16-29. Appleby, P.G., Flower, R.J., Mackay, A.W. , Rose, N.L. (1998) Palaeolimnological assessment of recent environmental change in Lake Baikal: sediment chronology. Journal of Paleolimnology, 20, 119-133. Boyle, J.F., Mackay, A.W. , Rose, N.L., Flower, R.J., Appleby, P.G. (1998) Sediment heavy metal record in Lake Baikal: natural and anthropogenic sources. 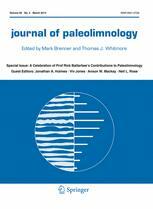 Journal of Paleolimnology, 20, 135-150. Rose, N.L., Appleby, P.G., Boyle, J.F., Mackay, A.W. & Flower, R.J. (1998) The spatial and temporal distribution of fossil-fuel derived pollutants in the sediment record of Lake Baikal, eastern Siberia. Journal of Paleolimnology, 20, 151-162. Dearing, J.A., Boyle, J.F., Appleby, P.G., Mackay, A.W. & Flower, R.J. (1998) Magnetic properties of recent sediments in Lake Baikal, Siberia. Journal of Paleolimnology, 20, 163-173. Mackay, A.W. & Rose, N.L. (1998) Characterisation and temporal distribution of atmospheric particulates (PM10s) in central London. Air Pollution VI Eds. C.A. Brebbia, C.F. Ratto & H. Power. Computational Mechanics Publications, Southampton. pp.947-958. Mackay, A.W. (1998) NERC - GEOPASS Mid Project Review: GR3/10529: minutes of Workshop 1. ECRC Research Report, 51, 8 pp. Mackay, A.W. (1998) Temporal trends of fungal spores in central London, and their functional relationships with environmental factors. JEI Working Paper, 2, 32 pp. Mackay, A.W. (1997) Peat erosion: some implications for conservation and management of blanket mires and heather moorland in the U.K. Conserving Peatlands. Ed by L. Parkyn, R.E. Stoneman & H.A.P. Ingram. Published by CAB International, Oxon. Chapter 8, pp. 81-86. Mackay, A.W. & Murlis, J. (Eds.) (1997) Britain’s Natural Environment: a State of the Nation Review. Ensis Publishing: London. 88 pp. Mackay, A.W. (ed.) (1997) Surface Water Acidification: the increasing importance of nitrogen. ECRC Research Report, 41, 19pp. Mackay, A.W. & Tallis, J.H. (1996) Summit - type blanket mire erosion in the Forest of Bowland, Lancashire, U.K.: predisposing factors and implications for conservation. Biological Conservation, 76, 31-44. Mackay, A.W., Flower, R.J. & Battarbee, R.W. (1996) Stratigraphical evidence of environmental change in Lake Baikal, associated with recent changes in climate. ECRC Research Report, 19, 166 pp. Flower, R.J., Mackay, A.W. , Rose, N., Boyle, J., Dearing, J.D., Appleby, P.G., Kuzmina, A.E. And Granina, L.Z. (1995) Sedimentary records of recent environmental change in Lake Baikal, Siberia. The Holocene, 5, 323-327. Flower, R.J., Monteith, D.T., Mackay, A.W. , Chambers, J.M. & Appleby, P.G. (1995) The design and performance of a new box corer for collecting undisturbed samples of soft sub-aquatic sediments. Journal of Paleolimnology, 14, 101-111. Mackay, A.W. & Tallis, J.H. (1994) The recent vegetation history of the Forest of Bowland, Lancashire, UK. New Phytologist, 138, 571-584. Mackay, A.W., Flower, R.J. & Battarbee, R.W. (1994) Further high-resolution analyses of surface sediment cores taken from Lake Baikal. ECRC Research Report, 18, 8 pp. Press, M.C., Parsons, A.N., Mackay, A.W. , Vincent, C.A., Cochrane, V. & Seel, W.E. (1993) Ecophysiological characteristics of the Mediterranean root hemi-parasite Bartsia trixago and Parentucellia viscosa. Oecologia, 95, 145-151. Mackay, A.W. , Flower, R.J., Appleby, P.G., Boyle, J., Dearing, J.A., Kuzmina, A., Monteith, D., Rose, N. & Battarbee, R.W. (1993) Recent environmental change in Lake Baikal, Eastern Siberia, with special reference to the sedimentary diatom record. ECRC Research Report, 1, 40 pp. Mackay, A.W. & Tallis, J.H. (1992) Possible causes of blanket mire erosion in northwest England. Proceedings International Peat Congress, 9(1), 244 - 255. Mackay, A.W. (1992) Peat erosion, Sphagnum and pollution. Quaternary Newsletter, 68, p13. I led a major interdisciplinary Darwin programme (with Martin Todd, University of Sussex) which investigated hydrological controls on aquatic biodiversity in the Okavango Delta, one of the world’s major flood-pulse ecosystems, and one of the last remaining pristine wetlands in Africa. This was a complex project that sought to build research capacity in Botswana, whilst undertaking geographically challenging fieldwork. Our biological, chemical and hydrological data fed directly into the Okavango Delta Information System database, used by all planning and implementation agencies involved in the Okavango Delta Management Plan. Capacity building was central to our project. We provided extensive training in environmental modelling and quantitative data analysis to colleagues both employed on the project and those employed by the Botswana government and Okavango Delta stakeholders. A particularly successful outcome of the project has been subsequent employment of three technical staff gaining permanent full-time employment with the University of Botswana, and the employment of the MPhil student (Richard Mazebedi) on the project securing a teaching job at the newly created Botswana International University of Science and Technology (BIUST). Expert Advice to Parliamentary Office of Science and Technology on Freshwater Trends (17th June 2015). Published as “Trends in the Environment” on 5th Jan 2016. Tom Davidson and I recently published an article in The Conversation, in recognition of the Okavango Delta being designated UNESCO's 1000th World Heritage Site. 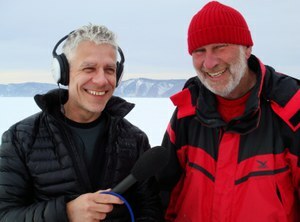 I co-produced a special edition of Radio 4's Costing the Earth: The Deepest Lake on Earth (16th+17th April 2013) related to pollution and climate change threats to Lake Baikal. You can listen to the 30 minute programme here. Whilst on fieldwork we were also filmed by national Russian news channel Rossiya 24, which was aired on 9th March 2013 - watch the report here. Interviewee and appearance on BBC4/BBC2 Around the World in 60 Minutes which has been aired 15 times since March 2011. INQUA 2015 Session: (Ngoya, Japan): What can the Quaternary record tell us about the stability, resilience and sensitivity of landscape systems and the services they provide? 2012: Co-organizer of 50 Priority Questions in Palaeoecology, an agenda-setting workshop which brought together leading academics, stakeholders, funding bodies and graduate students to focus on identifying some of the most pressing questions facing the discipline of palaeoecology today and into the near future. 2012: Co-organizer of 12th International Paleolimnology Symposium. I contribute to teaching in each of Years 1, 2 and 3 at UCL Geography. Ideas in Geography is an introduction to the history and philosophy of the discipline. Why does this matter? Because ideas develop in particular times and places; because they change, are forgotten and sometimes rediscovered; and because ideas have consequences – not just for academics but for the rest of the world as well. • to enable students to develop their own ideas about geography as a discipline and to understand the diversity of different approaches used in geographical research. The course aims to provide students with an introduction to the concepts and techniques useful for studying the nature of past environmental change since the last glacial period to the Holocene. The following topics are covered: (i) a range of natural archives of environmental change (e.g. lake and marine sediments, ice cores); (ii) chronological techniques used to date these archives; (iii) biological indicators used to reconstruct past environmental change; (iv) palaeoclimatic and human-impact case studies. The course has also been designed to give practical experience in the identification of biological indicators. The primary aim is to investigate topical environmental themes (important to the well-being of our planet) within the context of a long-term perspective (using palaeoscience approaches). A secondary aim is to encourage students to publicly participate in the themes developed on the course by the creation and maintenance of a weblog (‘blog’) site which counts towards 50% of the assessment. I regularly supervise up to 5 dissertations every year on most environmental topics. The MSc Conservation at UCL is widely recognised as the leading course for aspiring nature conservation professionals. This highly successful degree programme saw its first students graduate in 1960, and nearly 80% of its graduates have gone on to secure posts related to conservation. The MSc Conservation is strongly interdisciplinary and engages with environmental, social and policy dimensions. It has a vocational orientation, with residential field-classes providing first-hand experience of practical conservation challenges. The programme is unique not only on account of its long history and the resulting extent of its alumni network, but also due to the active involvement of nature conservation professionals in the delivery of course material. There is a pressing national and international need to understand the nature and consequences of climatic change and to develop adaptation strategies. The UCL Climate Change MSc provides rigorous scientific and vocational training for the next generation of climate change professionals. Students will acquire knowledge and understanding of the Earth System (atmosphere, hydrosphere, biosphere, lithosphere) and the nature and causes of climate variability and change. LUCA MARAZZI: Biodiversity and biomass of algae in the Okavango Delta (Botswana), a subtropical flood-pulsed wetland. 09.08 - 11.14 (co-supervision with Dr V. Jones). (Examiners Marian Yallop & Carl Sayer). PATRICK AUSTIN: Palaeoconductivity, lake level fluctuations and trace element history of the Aral Sea since 400 AD: assessing the impact of natural climatic variation and anthropogenic activity. Funding body: NERC. Studentship Award No. : NER/S/A/2002/10422. 01.10.02 – 30.09.05. (Examiners: Jane Reed & Scott Elias). JOANNA THORPE: Records of late Quaternary climatic change from Tswaing crater lake, South Africa, and the Central Kenyan Rift. Funding body: NERC. Studentship. Award No. : NER/S/A/2002/10423. 23.09.02 – 22.09.05. (Examiners: Phil Barker & Alayne Street-Perrott). DAVID MORLEY: Reconstructing Past Climate Variability in Continental Eurasia. Funding body: NERC CASE Studentship with NERC NIGL. Studentship Award No. : NER/S/A/2001/06430. 01.10.01 – 30.09.04. (Examiners: Phil Barker & Jane Reed). MUSONDA MUMBA: Vegetation and hydrological changes in the Kafue Flats, Zambia before and after the Itezhi-tezhi Dam. Funding body: UCL Hollis Scholarship 24.09.01 – 30.09.04 (co-supervision with Dr J. Thompson) (Examiners: Dr Douglas Taylor & Prof. Edward Maltby). GIRI KATTEL: Cladoceran zooplankton in European Mountain lakes: their role in reconstructing climate change. Funding body: ORS / Grad School / ECRC Trust Fund 01.10.00 – 30.09.03 (co-supervision with Prof R.W. Battarbee). (Examiners: Glen George & Sarah Metcalfe). DARIA KUZNETSOVA (MSc Conservation; Dissertation Distinction) Temporal and spatial variations in ostracod communities in the Selenga Delta, Lake Baikal. ROBERT MERRITT (MSc Climate Change) Towards estimating climate change impacts in select Pacific small island developing states (SIDS). CORINNE CHAND (MSc Aquatic ScienceS) Diving and foraging behaviour of adult little terns, Sternula albifrons, at Blakeney Point in Norfolk. SAMUEL NORTH (MSc Aquatic Science; Distinction) Interglacial comparisons in the Near East: the palaeoecology of diatoms in Lake Van. 2016-2019: IGNEX: Interglacials and glacials - natural experiments in biodiversity dynamics. A new inter-disciplinary programme to Prof John Birks at the Ecological and Environmental Change Research Group, Bergen University. 2016-2017: The effects of differential dissolution on the δ18O composition of diatom silica. Funded by NERC. Reference IP-1584-1115. The project is in collaboration with Professor Melanie Leng, Dr Andi Smith and Dr George Swann. Amount £42,200. 2012-2015 Silicon isotope records of recent environmental change and anthropogenic pollution from Lake Baikal, Siberia. Funding sourceNERC. Reference NE/J010227/1. Amount awarded £710,000. PI, Lead RO: George Swann; PIs: Matthew Horstwood. 2009-2010 A diatom oxygen isotope record from Lake Baikal during MIS5e/5d: an application of XRF and FTIR to accurately account for persistent contaminants. Funding body: QRA. Co-investigator George Swann. Amount awarded: £500. 2007-2010 Reconstructing Late Holocene climate variability in North East China from varved maar lake sediments. Funding body: NERC NIGL. Co-investigators Virginia Panizzo & Melanie Leng. Amount awarded: £13,300. Reference: IP/981/0507. 2006-2010 Baikal Aracheology Project. Funding body: Major Collaborative Research Initiative (MCRI) program of the Social Sciences and Humanities Research Council of Canada. Principal Investigator: - Prof. Andrzej Weber, Anthropology, University of Alberta, Canada. 2006-2007 A diatom reconstruction of the Les Echets Eemian sequence, France. Funding body: Postdoctorat Quadriennal, CNRS program, IMEP (UMR 6116 CDNRS, FST-U3). Principal Investigators: - Dr V. Andrieu-Ponel, CNRS; Dr Anson W Mackay, UCL; Dr P. Rioual, Department of Geology of the University of Beijing (China). Post-doctoral scientist: Dr DW Morley. 2006-2007 Reconstructing climate variability in Inner Mongolia over the last 1000 years. Funding body: Chinese Academy of Sciences & UCL Simon Li Research Fund. Principal Investigators: Dr Luo Wang & Dr Anson W. Mackay. 2003-2005 Reconstructing palaeoclimates during MIS 11 in central Asia using oxygen isotope analysis of diatom silica. Funding body: NERC NIGL. Co-investigators Eugene Karabanov & Melanie Leng. Amount awarded: £33,000. Reference: IP/740/0302. 2003-2005 CLIMAN: Holocene climatic variability and evolution of human settlement in the Aral Sea Basin. With Hedi Oberhaensli + others. Funding body: INTAS. Total award: €120,000. Reference: INTAS Aral 30. 2001-2004 CONTINENT: High-resolution continental paleoclimate record from Lake Baikal: a key site for Eurasian teleconnections to the North Atlantic Ocean and monsoonal system. With Oberhaensli (co-ordinator) + other co-investigators. Funding body: EU Framework 5. Amount awarded: c. €2,000,000. Reference: EVK2-CT-2000-0057. 2001-2003 Biological, chemical and physical monitoring of Lake Baikal water column. Funding body: The Royal Society. Amount awarded c. £15,000. 2001-2002 Climatic change in Central Asia during marine isotope stage 3: biogenic silica analysis . Funding body: NERC ICP-AES Centre. Co-investigator: George Swann. Award No. : OSS/221/050. Amount £1,000. 2000-2001 Reconstructing Late Glacial - Holocene climate change in Lake Baikal using oxygen isotope analysis of endemic lacustrine diatoms. Funding body: NERC NIGL. Amount awarded: £32,000. Reference: IP/635/0300. 1996-1999 The deposition and accumulation of endemic planktonic diatoms in the sediments of Lake Baikal and an evaluation of their potential role in climate reconstruction during the Holocene . Funding source NERC. Reference GR3/10529. Amount awarded £121,404. PIs: Prof. R.W. Battarbee & Dr. R.J. Flower. 2006-2009 Monitoring and simulating threats to aquatic biodiversity in the Okavango Delta. Funding body: DEFRA DARWIN Programme. co-PI: Martin Todd. Amount awarded c. £188,000. 2004-2005 Climatic change in tropical Africa during the last interglacial. Funding body: NERC NIGL. Co-investigator: Jo Thorpe, Martin Trauth, Melanie Leng. Ref: IP/816/05-04. Amount awarded: £20,000. 2004-2005 Climatic change in southern Africa during the last interglacial : chronology development. Funding body: NERC NIGL. Co-investigator: Jo Thorpe & Open University Uranium-Series Facility. Amount awarded: £15,000. Ref: IP/793/1103. 2004 Late Holocene changes in alpine vegetation of the Rwenzori Mountains: Short Term Visit grant to the UK for Visiting Scientist: Dr Immaculate Ssemmanda, Uganda. Funding body: The Royal Society. Amount £3,360. With Richard Taylor. 2003-2004 Climate change threatens aquatic ecosystems of the Rwenzori Mountains, East Africa. Funding bodies: various, including Royal Geographical Society £7,500; QRA £360; Grad school & Dean's Fund: c. £2,500 . PI & Expedition leader: Richard Taylor. With Neil Rose, Ginnie Pannizo, Lucinda Mileham and Adinah Shackleton. 2012 50 Pressing Questions in Palaeoecology. PIs: Alistair Seddon, Ambroise Baker, University of Oxford. Amount awarded: QRA £500; PAGES £3100; BES £2000; Oxford University £2000. 2000 - 2005 Biological, chemical and physical monitoring of Lake Baikal water column. Funding bodies: Royal Society and Siberian Branch Russian Academy of Sciences. Amount awarded: c. £10k per year. With Nick Granin (Limnological Institute) and David Jewson. 1998 Holocene Climate Reconstruction. With Rick Battarbee. Funding Source: EU Framework 4 for an 11 day Advanced Study Course. Amount awarded: €79,000. Reference: ENV4-CT97-4013. Course Dates: 15th June - 25th June, 1998. 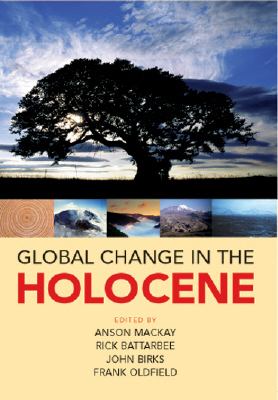 See Advanced textbook Global Change in the Holocene (2003). 1996 -1999 The deposition and accumulation of endemic planktonic diatoms in the sediments of Lake Baikal and an evaluation of their potential role in climate reconstruction during the Holocene. Funding body: NERC (GR3/10529). Amount: £120k. PIs: Rick Battarbee, Roger Flower, Mike Sturm, David Jewson.